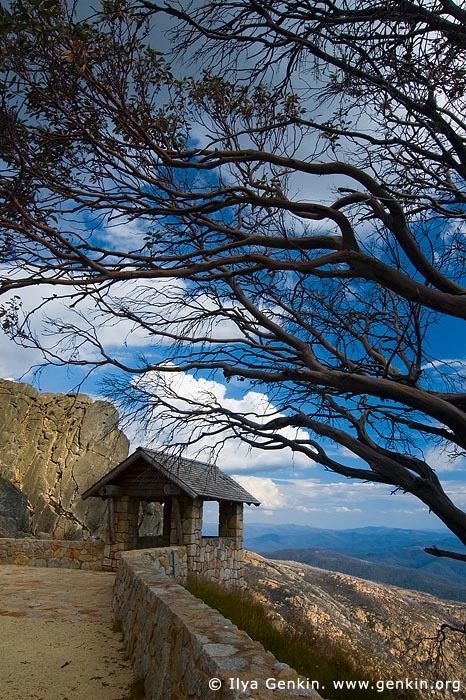 Vertical image of the old rock built hut nicely surrounded by a curved dry tree at the starting point of the Horn mountain summit walking in Mount Buffalo National Park, Victoria Hight Country, Australia. This viewpoint offers great view over Australian Alps for all tourists and visitors. This image id MOUNT-BUFFALO-VIC-0008 of Old Stone Hut and View over Australian Alps from The Horn, is copyrighted © by Ilya Genkin. This is not a public domain image.